The TSC DA210/DA220 series desktop label printers are a compact solution for various applications. They are, for example, ideal for tasks in retail, entertainment, warehouse and logistics environments as well as in the healthcare sector. 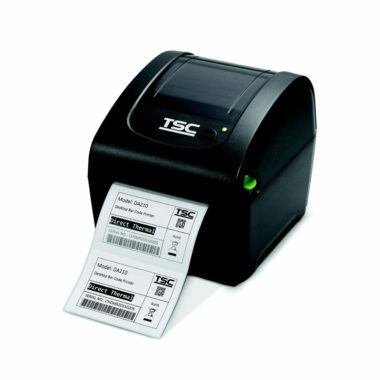 The DA210/DA220 direct thermal printers by TSC excel at simplicity and come at a favorable price. If you are looking for an easy-to-use label printer for flexible application, the direct thermal printers of the DA210/DA220 series are the perfect solution. Their compact clamshell design enables uncomplicated media loading and the sturdy construction ensures a long life. The TSC DA210/DA220 series’ printers enable 1D and 2D barcode as well as text printing at a maximum print speed of 6 ips and at a print resolution of 203 dpi. Maximum print width is 108 mm. The TSC DA210/DA220 series consists of two printer models: DA210 and DA220. The DA210 version comes with 8 MB Flash memory and 16 MB DRAM. It is equipped with USB 2.0 high speed. Optional, Bluetooth 4.0 can be integrated and an adaptor for 1.5” paper core media can be added as well as an external roll mount. The DA220 model, on the other hand, provides 128 MB Flash memory and 64 MB DRAM. The standard interfaces include USB 2.0 high speed, USB Host, RS-232 serial and Ethernet. Additionally, an optional PCBA2 provides USB 2.0 and Ethernet. Further interface options are: 802.11 a/b/g/n WiFi and internal or external Bluetooth. For more convenient use, there is various optional equipment available: real time clock, peel-off module, cutter, adaptor for 1.5” paper core media, external roll mount, keyboard display unit, programmable smart keyboard. Depending on your requirements, either the TSC DA210 or the DA220 may be just the right choice for uncomplicated and flexible label printing.